In 2003, the United Kingdom constructed the Beagle 2 Mars Lander, which was scheduled to touchdown on the red planet on Dec. 25 of that year. Ground crews lost contact with the lander on Dec. 19, and Beagle 2 was officially declared “lost” in Jan. 2004. No evidence of the lander or any data from it has been found until now. A set of three images provided by NASA’s Mars Reconnaissance Orbiter (MRO), currently in orbit around the red planet, have shown Beagle 2’s final resting place. MRO is equipped with High Resolution Imaging Science Experiment (HiRISE) camera. The trio of HiRISE images have captured a view of the little lander on the Martian surface. 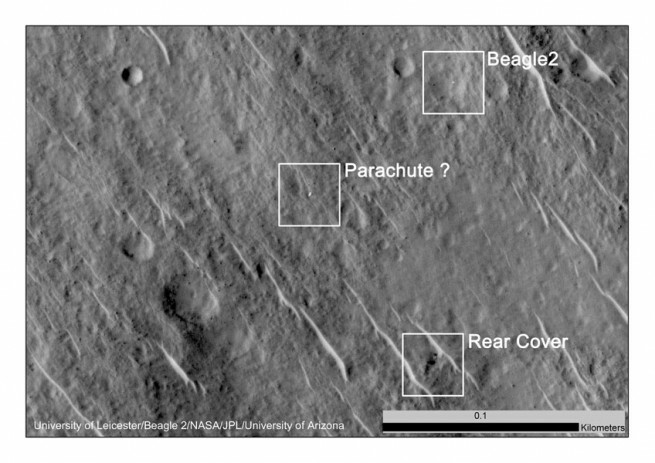 Based on the photographs, researchers can say Beagle 2 survived its landing on Dec. 25, 2003, and was able to partially deploy its solar arrays. 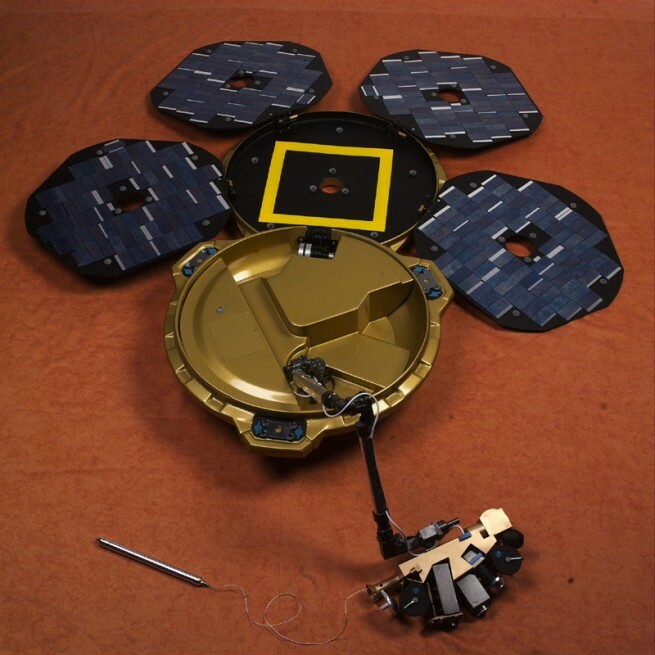 Beagle 2 was part of the European Space Agency’s (ESA) Mars Express mission, and was a collaboration between industry and academia, aimed at delivering world-class science to the Martian surface. For over a decade now, teams have been scouring through data, hoping to eventually discover what happened to the lander. Michael Croon of Trier, Germany, a former member of ESA’s Mars Express operations team, initially searched through the HiRISE images, hoping to locate the lander. He was able to locate evidence of the lander and its decent components – parachutes as well as rear cover. All three were located close to the equator, in the impact basin of Isidis Planitia. 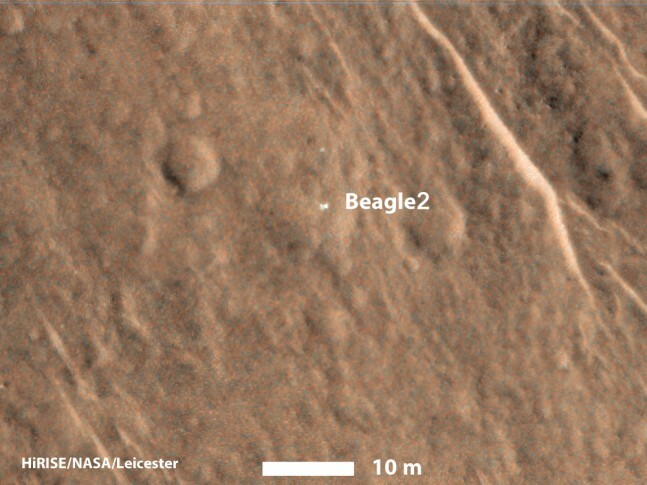 The Beagle 2 team, along with the HiRISE team, and NASA’s Jet Propulsion Laboratory (JPL), have gone over the images several times with a fine-toothed comb and have definitively concluded that the objects discovered in the image are the proper size, shape, and color to belong to Beagle 2. Image analysis shows the lander’s solar arrays to be partially deployed, with what appears to be its rear cover with the pilot (drogue) chute still attached and main cover close by. Beagle 2 is a small lander, measuring less than 7 feet (2 meters) in diameter when fully deployed. The lander is right at the limit of what HiRISE, the highest-resolution camera orbiting Mars, can detect. All three objects are within the landing area, and are located approximately three miles from the center of the landing site. HiRISE is operated by the University of Arizona, Tucson. The instrument was built by Ball Aerospace & Technologies Corp. of Boulder, Colorado. The Mars Reconnaissance Orbiter Project is managed for NASA’s Science Mission Directorate in Washington, by JPL, a division of the California Institute of Technology, Pasadena. So even though Beagle2 was not in contact with Earth, it still ran its EDL “program” and made it to the surface in one piece? And partially deployed its solar panels? Fantastic achievement none the less.